As a user of a manual brush-type shower we wanted to make you aware of the many benefits of upgrading to our Automatic Brush Shower. 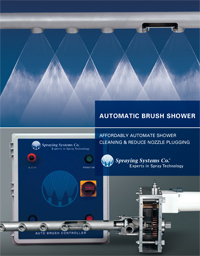 The Automatic Brush Shower uses a motor and controller to eliminate the need for human intervention to rotate the brushes. Ensuring nozzles are clog-free can be as easy as pushing a button with the new Automatic Brush Shower. Cleaning cycles occur regularly - all workers need to do is press one button. However, the use of an optional programmable timer enables a totally automated operation. An initial set-up of your cleaning schedule is all that is needed. Gear lubrication is only required twice a year. So, if you’ve automated the cleaning cycles, you really only need to check the Automatic Brush Shower once every six months. In addition, retrofitting your current brush shower to the Automatic Brush Shower can be done in less than seven minutes. See just how simple the process is by watching this short video. Improve Bakery Operations Using Spray TechnologyAre you wasting thousand each year on worn nozzles?